RETIRED AND CRAZY- ME? SURELY NOT! : THAT WAS THE WEEK, THAT WAS! Firstly, congratulations to my son-in-law Jamie. Not only did he complete the Iron Man Challenge last weekend, he is also the only son-in-law who, on the surface of it, still likes me. Whew. Two feats of extreme endurance and I'm not sure which one should earn him the most "brownie" points! For those who are unfamiliar with the challenge it's a 2.4 mile swim followed by a 112 mile bike ride and than a 26.2 mile run. 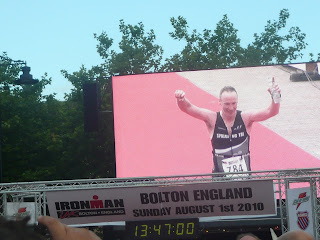 You can read all about it at http://ironman.com/events/ironman/uk/?show=about#axzz0vopw6INh. Is he super fit, or what!? And he is also a throughly nice guy. Love you, love your wife, and love your two great boys. Well done Jamie. As for the rest of the week? Mixed in the extreme! My grandaughter, her husband, one of the girls and one of the babies have been extremely poorly. Dan started it off with sickness, followed a day later with flu like symptoms and then a few days later sore throat, mouth ulcers and agonising gum pain, drenching night sweats and delirium. Then George, Noah and Orianne went down with it. The medics have diagnosed - stomach upset, flu, tonsilitis, thrust, mouth ulcers and cold sores, ! It lasts about 10 days and is vicious in the extreme. Dan lost over 20lbs in that short time. Dan's gym instructor had the same symptoms and she was told it was because she was too old to be doing the job and this was her body protesting! I have two worries. If they are the only ones in the area to have these symptoms why are they not being investigated or if not why didn't they tell them and give some idea of what to expect? One Doctor even told George off for bringing the baby to see him! Another trauma this week was that my computer also became chronically sick. Fortunately my family and computer are now well on the way to recovery. So now we are on the up again! Sorry to hear about the illness - very very nasty. I hope you don't get it. That Ironman is some challenge: I have seen it on TV and wondered if I would have dared even to contemplate trying it when I was young! Congratulations to Jamie, he's a helluva a man ... even if he does still love you! Heavens, that illness sounds very nasty! And the doctor told her off for bringing the baby? How dare he? Is it not his job to examine and treat sick people? And who more important than a baby? Well done to your son-in-law - the Ironman challenge sounds absolutely gruelling! I know, even Jamie has his defects DogLover. I think that the younger generation of doctors have never heard of the hyppercratic oath Jay. They haven't even heard of the hippocratic oath either!! I should add that DogLovee became exhausted from correcting my bad grammer and appauling spelling. I hereby give you permission to continue with the good work DogLover, as along as you don't expect me to change or remember! Thankfully, everyone is on the road to recovery and you didn't get ill! Too bad doctors seem to have forgotten the reason they went into medicine in the first place! !